Palm-fringed beaches, chilled locals, and a glass of rum punch practically everywhere you turn - Tobago is all about taking it easy. This small island, where ancient rainforest blankets the hills, is one of the most unspoilt islands in the Caribbean. But even though Tobago is quieter and less built-up than its neighbours, there’s a mix of boutique hotels, eco-retreats, and luxury spa hotels to choose from. Even though Coco Reef is one of the most luxurious hotels in Tobago, it’s also one of the most fun. It’s like a Caribbean version of Wes Anderson’s Grand Budapest Hotel – everything is painted either coral-pink or gold. Small statues dot the lobby, huge paintings liven up the walls, and real-life hawks watch over the breakfast room. There are so many staircases and corridors, it took me all morning to find the gym. With lush gardens on one side and a private beach to the other, Coco Reef exists in its own slice of tropical paradise. The expansive lobby looks out onto the beach, where palm trees curve over yellow deck chairs. And the hotel’s crystal clear lagoon, separated from the open sea by rocks, is safe for swimming and snorkelling. Unlike the white linen and dark wood of many other Tobago hotel rooms, the rooms at Coco Reef are decked out with floral bedspreads and wicker furniture. The decor might not be to everyone’s taste, but it’s wonderfully Caribbean. To make the most of a stay here, book an ocean view room. Sitting on your balcony at sunset, watching boats bob on the silky waters of the Caribbean Sea, you’ll realise the upgrade was worth it. There’s something playful about Bacolet Beach Club – a boutique hotel on the coast of Tobago. 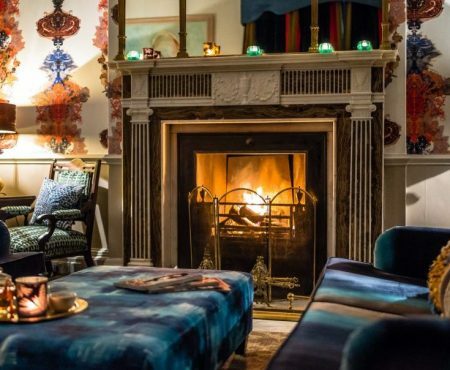 Clusters of colourful, vintage-style chairs liven up the white lobby, while the bedrooms have marble tiles and four poster beds. Outside, two sleek infinity pools look out to sea and a wooden bridge crosses jungle to reach the restaurant. But the eclectic nature of Bacolet Beach Club all makes sense when you meet the owner and designer. Gloria Jones Knapp, a former model, is a glamorous bundle of fun and energy. She strides the gleaming corridors in heels but kicks them off to trot down to the hotel’s secluded beach. A wooden staircase leads from the hotel to the beach, winding through bamboo, palms, and almond trees. Halfway down, the tree-house style ROK Bar is an almost ridiculously perfect place to have a sunset cocktail. Perched on a wooden platform, ROK Bar overlooks Bacolet’s beach – a shady cove with golden sand and warm waves. The Villas at Stonehaven take luxury, seclusion, and natural beauty to another level. 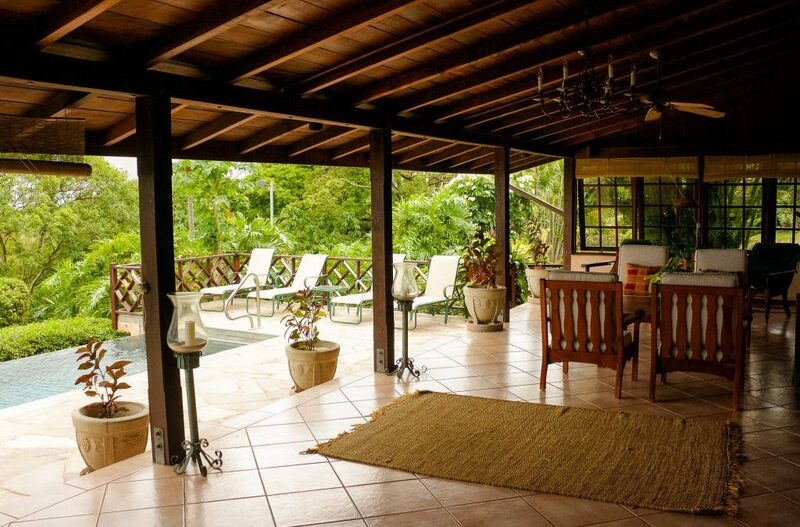 Bordering a bird sanctuary on the west coast of Tobago, the 14 villas fan out across 11 acres of grounds. Separated by palm trees and tropical gardens, each villa comes with an infinity pool and ocean views. They’re equally lovely inside. Built and designed in a French colonial style, the villas are spread out over two floors with three double bedrooms. A king size bed dominates each spacious room and the dark wood and muted colour palette all contribute to the overall feeling of luxury. The villas are available on a one, two, or three-bedroom basis. 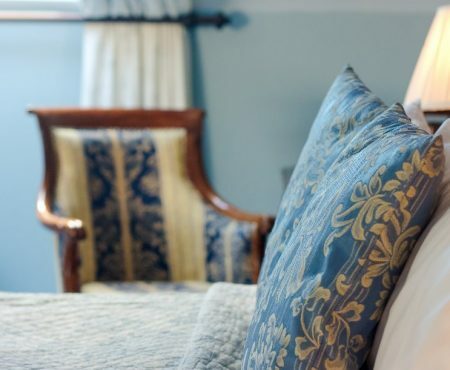 There’s a personal housekeeper for each, who can leave a welcome basket of food and cook meals on request. But if you feel like a change of scene, you can head to the airy Pavilion Restaurant and Clubhouse for lunch, dinner, or a swim in yet another infinity pool. Shepherd’s Inn is an example of how varied hotels in Tobago be. Located in Crown Point, the inn has just 20 rooms and lacks the extensive facilities of bigger resorts. But it’s close to the white sand beaches of Store Bay and Pigeon Point and has an onsite dive school – R & Sea Divers. R & Sea offers scuba diving charters to Tobago’s best dive sites, the full range of PADI certification courses, and a Discover Diving programme for beginners. Cabana-style rooms circle the pool at Shepherd’s Inn. These rooms are quite dark inside, but the floor-to-ceiling wood panelling and comfy bedding give them an unexpected ski chalet feel. The rooms overlooking the tropical garden are more spacious and secluded. And if you want to go all out, there’s a luxurious two-bedroom suite hidden at the end of the garden. If you want to go diving, or if you’re just looking for a cosy alternative to the bigger resort hotels in Tobago, Shepherd’s Inn is ideal. Cuffie Nature Retreat is one of the most eco-friendly hotels in Tobago. 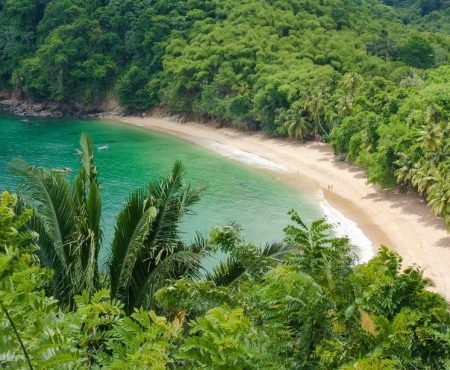 This two-story hotel sits on the edge of pristine rainforest – the oldest protected rainforest in the western hemisphere. Backed by jungle-covered mountains, Cuffie is a place where jewel-toned hummingbirds zoom past the windows and waterfalls tumble nearby. Cuffie Nature Retreat is run according to green principles, but you don’t need to be a full on eco-conscious traveller to enjoy it. It’s very comfortable. The bedrooms are spacious and airy, with balconies overlooking the rainforest and bird feeding areas. Meals are prepared with fresh, often home-grown, produce and drinking water comes from a spring on the property. Outside, an elevated salt-water pool has views out over the lush valley and mountains. Guests can also book nature tours through the surrounding forest – a great way to spot shyer bird species. Given its rainforest location, Cuffie River is a quite a drive from any restaurants or shops. But there are full-board or half-board options, so you don’t have to leave unless you want to. Castara Retreats definitely isn’t a typical hotel. This rustic eco-resort offers the opposite to package holidays – instead, it focuses on experiences that contribute to, rather than disrupt, the local culture and ecosystem. The wooden apartments of Castara Retreats are an impressive combination of sustainability and luxury, topped off with expansive views out over Castara Bay and forest-covered hills. I love what Castara stands for – sustainability and authenticity in every form. The restaurant doesn’t serve breakfast and guests are encouraged to stroll to local restaurants in the mornings. The cost of extra services, like laundry, go directly to the housekeeping team and staff members are also stakeholders in the business. Even the construction of Castara Retreats was carried out respectfully. Sue and Steve, Castara’s owners, employed local people to build the lodges and apartments that nestle unobtrusively into the hillside. Staying at Castara Retreats is an opportunity to be immersed both in nature and in the local culture. Steve and Sue have spent years creating a wildlife sanctuary in Castara Retreats’ tropical gardens, so don’t be surprised if you wake up to the sound of bird song. There’s also a newly built yoga shala at Castara, making it a wonderful location for a wellness or yoga retreat. It’s easy to feel fancy in Blue Haven, a boutique hotel that overlooks the Bacolet Bay. Once the hotel of choice for 1950s film stars, Blue Haven still has a bit of old Hollywood glamour about it. With its coral-pink facade, a grand lobby that faces out to sea, and a dramatic cliff-top location, Blue Haven is one of the loveliest hotels in Tobago. All 55 bedrooms have balconies that face out to sea. The airy rooms are tasteful and you can order breakfast in bed, if you don’t feel like trekking to the dining room. There’s also an outdoor pool, tennis court, and lots of shady spots among the palm trees. Blue Have overlooks a quiet, jungle-fringed beach, so it’s a short walk to the ocean. But despite its size, Blue Haven is a low-energy hotel. There’s a solar-based water heating system and the restaurant uses locally-grown produce. Kariwak Village is a tranquil eco-resort with a strong focus on wellness. On-site holistic therapists offer aromatherapy, shiatsu, and Thai yoga massage. All meals are prepared from scratch, using fresh, local ingredients. And then there’s the staff – who seem to radiate serenity. So, if you’re looking for somewhere to take time out, Kariwak Village is the place to book. The rooms at Kariwak are cabana-style and decorated in fresh, calming tones. 18 of the rooms are close to the pool, while the six garden rooms are more secluded. The gardens are what make Kariwak really special. Yoga and tai chi classes are held in the spacious yoga shala. There’s a hidden jacuzzi in the corner of the gardens, complete with a refreshing waterfall, and guests can also lounge away the day in the hammock area. A thriving herb garden runs alongside Kariwak’s main building, providing fresh seasoning for dishes prepared in the restaurant. Blue Waters Inn is not the easiest place to get to. Driving to the hotel involves rattling down a steep, narrow driveway with a sheer drop to one side. But it’s all worth it because Blue Waters Inn has one of the wildest, and most romantic settings, of all the hotels in Tobago. It’s a place that could inspire all kinds of adventure stories – a stretch of golden, windswept beach facing the green hump of Little Tobago. The hotel itself sits right on the private beachfront, its infinity pool bordering the sea. There’s a variety of rooms to choose at Blue Waters Inn, ranging from superior to beachfront bungalows. But guests here typically spend most of their time in the water – some of Tobago’s most impressive dive sites surround Blue Waters Inn. The onsite Dive’N is PADI 5 star IDC dive school with fully qualified instructors. Nearby dives sites range from the beginner level Angel Reef to the advanced Blackjack Hole. Magdalena Grand Beach and Golf Resort is a big, luxurious hotel in the tropical Tobago Plantations Estate. The facilities are extensive – there’s a fitness centre, three swimming pools, sauna rooms, and direct beach access. The Equilibrium Face and Body clinic offers a variety of spa treatments and there’s even a small art gallery displaying Caribbean art. Outside, there’s a 19-hole golf course, tennis courts, and walking paths. Magdalena Grand has 178 deluxe ocean front rooms, as well as one- and two-bedroom suites. There’s also a seemingly endless number of restaurants and bars to choose from around the property. Magdalena Grand is a world away from Tobago’s laid-back eco-resorts and boutique hotels. But if facilities are at the top of your priority list, then this hotel might have everything you need. Planning a visit to one of these hotels in Tobago? If you’re not renting a car, check with the hotel to see if they have an airport pick up service. Most hotels in Tobago offer half board and full board options when you book. If you want to book extra activities, like diving or a rainforest trek, your hotel can usually help you to organise it. Many thanks to Visit Tobago for hosting me. All opinions and photos are my own. This post contains some affiliate links, which means The Idyll receives a small commission on bookings made through Booking.com.